Sasquatch Fly Fishing has been guiding in Rocky Mountain National Park since 1996. 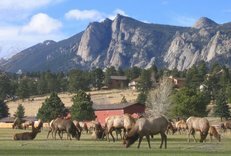 We offer the largest variety of trips in Estes Park at the absolute best prices! Sasquatch Fly Fishing has been offering guided fly fishing in the Estes Park valley for over two decades. Our expertise is unmatched in Rocky Mountain National Park. Join us for one of the many creative and exciting trips we plan for groups every year. Whether you are an individual looking for a private outing or a group of 20 who want to go enjoy the outdoors - Sasquatch Fly Fishing can do it all! We are usually open from mid-May through the end of August. But trips in September are a possibility (call or e-mail for details). Sasquatch Fly Fishing is located at the YMCA of the Rockies on the outskirts of Estes Park, Colorado. The YMCA of the Rockies is one of the greatest family resorts in the United States and is consistently booked for the summer! If you are looking for reservations to stay at the YMCA I recommend getting an early start. Please note - you​ do not​ need to stay at the YMCA to go fishing with Sasquatch Fly Fishing - so no matter where you are staying, give us a call and we will take care of you! 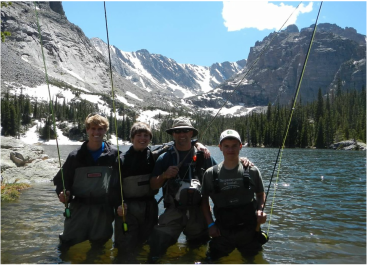 In Colorado it is required that you have a Colorado fishing license if you are 16 years of age or older. Licenses can be purchased at our desk or online.